Hindmarsh Stadium is a multi-purpose stadium located in the Australian city of Adelaide, and it is currently known as Coopers Stadium for sponsorship reasons, after Coopers Brewery purchased the naming rights. 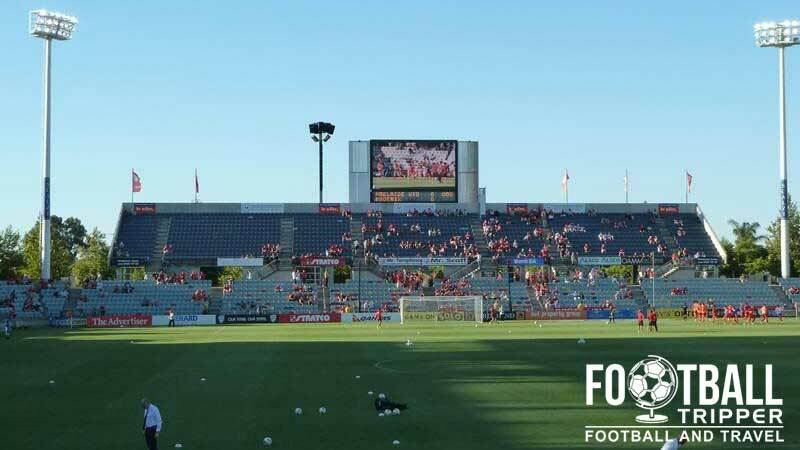 Adelaide United FC regularly fill the 17,000 capacity arena and there’s every chance of it being expanded in the future. Coopers Stadium was built in 1960 on the site of West Torrens Football Club’s former ground the Hindmarsh Oval (1905 – 1921), a team which participates in the Australian rules Football. The Soccer Association of South Australia initially wanted to use a former brick pit known as Rowley Park as the location of the new football stadium but opted against this after learning of the difficulties of cultivating grass within the proposed site which is now a speedway track. The stadium opened in 1960 with an initial capacity of 15,000 and the rectangular design with all-terrace spaces proved to be popular amongst fans of Adelaide FC. When Soccer was less popular in Australia in the 1970’s and 1980’s Hindmarsh regularly held matches of the National Team (The Socceroos) in addition to both Rugby Union and Rugby League Matches. When Australia were awarded the right to host the 2000 Summer Olympic Games, the old wooden grandstand was replaced in 1996 with a new two tiered seating structure, as Hindmarsh stadium became one of the chosen venues to host football matches for the tournament. In addition to this, the pitch was extended by 10 metres in order to accommodate more sports, and new electronic equipment was installed such as floodlights and television display units. 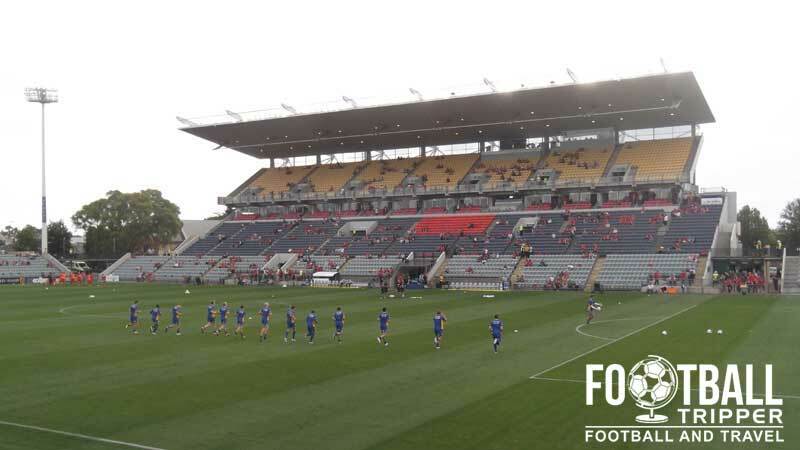 With Football becoming more popular across the country post-millennium, matches of the Socceroos are generally held at either Brisbane’s 52,5000 Suncorp Stadium or Sydney’s 84,000 capacity ANZ Stadium. This means Hindmarsh is primarily used within the domestic A-League for games of Adelaide United FC. Hindmarsh Stadium consists of the following four stands: North, East, South and West. Away fans are usually housed behind the goal within the lower-tier of the south grandstand. 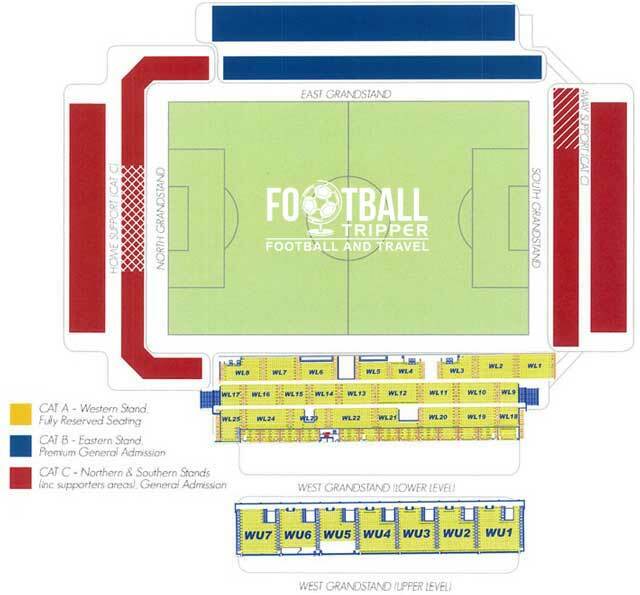 All seating is reserved for the travelling supporters. One of the most popular pubs on matchdays for supporters is the Joiners Arms which is on Manton Street, with The Ballroom Function Centre technically the closest. Two blocks way north-east of the ground there is Port Road which is full of bars and restaurants as is the centre of Adelaide. Between Port Road and Manton Street there are a lot of diverse dining options on matchdays: Taste of Bollywood, Enzo’s Original Italian, So Wok Noodle Bar, Benevento Woodfired Pizzeria, and Mango Tree Authentic Thai. Within the concourses of the ground there are the usual range of stadium classics on offer such as hot dogs, pies, pasties, pizza slices and sausage rolls amongst others. 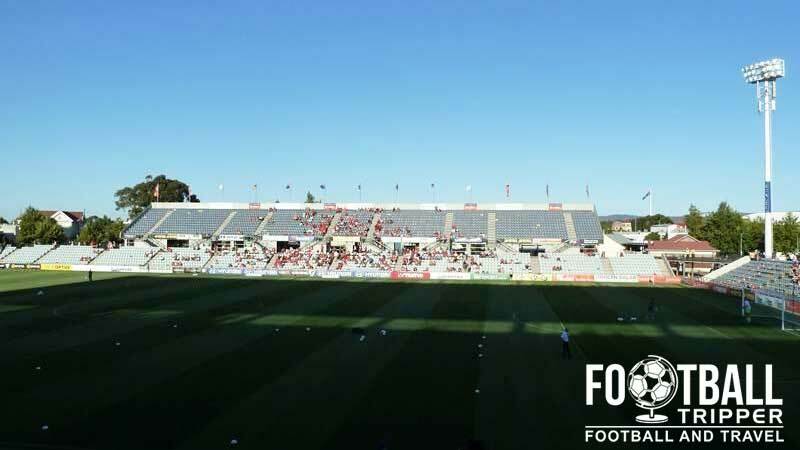 Neither the ground operators or Adelaide United currently offer supporters the chance to undertake a tour of the facilities at Coopers Stadium. If this changes however we’ll be sure to update this section. Adelaide United fans appearing to be in good voice as they march onwards towards the stadium. 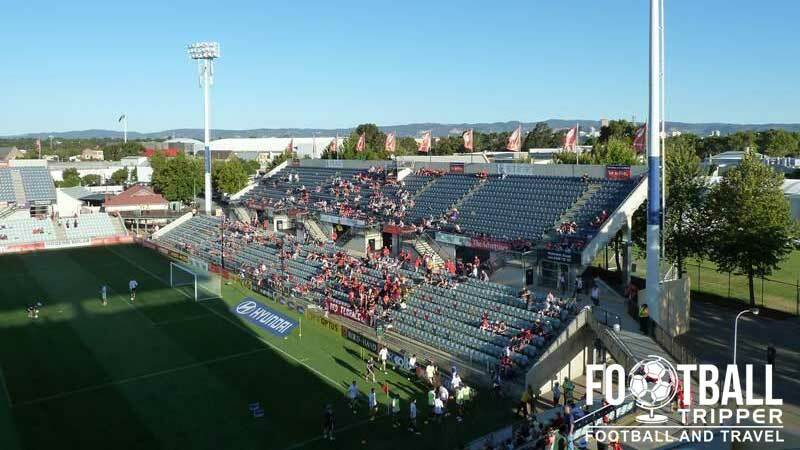 Coopers Stadium is located in West Hindmarsh approximately 4.4 kilometres north-west of Adelaide’s center, Victoria Square. One of the main entrances to Hindmarsh Stadium, home of the reds. Depending on your starting point in the city, it could take you anywhere from 30-50 minutes by foot, with the walk likely taking you through Bonython Park. If you’re planning to cycle you will be pleased to know that there are bike racks/rails located near the Eastern Stand where the general public enters. Alternately you can catch a cab. There is a Taxi Rank located at the corner of Hindmarsh Place and Manton Street which is next to the Eastern Stand/General entrance to the ground. The tram is recommended as the easiest and most affordable way of travelling to Coopers Stadium from Adelaide city centre as it takes less than 15 minutes and is free! The closest tram station to the stadium is Stop 6 Manton St- South side. Serviced depart from the city centre. For more information and to plan your journey you can always visit Adelaide Metro’s website. The Bowden Train Station is approximately 500m away from Coopers Stadium, and it is the first station on the suburban railway lines which link Adelaide to Outer Harbor and Grange. It is a more suitable alternative to the tram if you are travelling from out of town. The main platform of Bowden Station. Buses which take you up to less than 300m of Hindmarsh Stadium are 115, 150 and 157 with various places you can get on throughout the city. Just look for bus stops throughout the city and then read the travel information provided. Within the suburb of Hindmarsh there are three or so hotels located on Port Road including Hope Inn Hotel, The Land of Promise Hotel and Governor Hindmarsh Hotel. Back within the centre of Adelaide there are more mainstream choices such as a Hilton, Ibis and Comfort Hotels.